An bhfuil video dráma na Nollag deirneach ag éinne? Chaill mamaí Elsa a ceann agus ba mhaith léi cóip a fháil ó duine éigin. Bhí Elsa an 'Báibín Béar' sa dráma! Has anyone a video of the last Christmas play? Elsa's Mum lost hers and would like to get a copy from someone. Elsa was the 'Baby Bear' in the play! School Website - volunteers needed! The school is no longer supplying stationery for 3rd class upwards. Please arrange the following for your child asap. Our apologies for not giving you prior notice. Fáilte romhaibh go léir that nais. Tá an chéad lá curtha dúinn anois agus d'éirigh go breá linn leis. Teastaíonn uaim roinnt eolas a cur in gcuimhne daoibh agus a fháilt uaibh. Ar dtús teastaíonn uaim bhur n-aigne a dhíriú ar an éide scoile. Ba cheart bróga scoile oiriúnacha dorcha a bheith ag na páistí ar fad, ní mar shampla buataisí, bróga Lelli Kelly, UGGS ná bróga reatha ildaite. Tuigim go mbíonn bróga faiseanta ag teastáil ó pháistí, ach bheadh sé níos fearr iad sin a chaitheamh lasmuigh d'am scoile. 10 ticéid - 30 nóim am órga ar scoil. Táim cinnte go mbeidh na páistí an-sásta faoi seo agus go mbeidh sé níos fusa iad a cur ina n-éide scoile iomlán! Ní cheart go gcaitheadh aon pháiste seodra seachas fáinní cluasa beaga bídeacha- (studs beaga) más maith leo féin ach gan amhras ní ghá. Seo ar cúiseanna sláinte agus sábháilteacha. Ba cheart go mbeadh stíl ghruaige néata oiriúnach ar gach pháiste agus ba cheart dos na cailíní a gruaig a bheith ceangailte siar más féidir chun (iarracht a dhéanamh) cosc a cur le scaipeadh míoltóige ghruaige. Míneofar seo ar fad dos na páistí ar scoil. Bhí roinnt mhaith páistí anuirigh a roghnaigh gan snámh a dhéanamh ar cúiseanna éagsúla. Teastaíonn uaim a fháilt amach an mó páiste a bheadh ag glacadh páirt i mbliana chun an cinneadh a dhéanamh é a cur ar fáil nó deireadh a cur leis. Obair breise atá ann dos na múinteoirí, do Hilda agus domsa ach fós is dóigh linn gur fiú é dos na páistí. Dá lúithe an grúpa is ea is mó an chostas mar sin déanfar an cinneadh nuair a fheicim na torthaí. Beidh liosta ranga na bpáistí ag crocadh ar dhoras a seomra ranga. Cuir tic faoi sea nó ní hea ar an liosta nó cur glaoch ar Hilda chun a rá léi roimh an Aoine seo chugainn le bhur dtola. Costas timpeall €11 an cheacht a bheidh ar na ranganna má théann siad ar aghaidh (le haghaidh 7 nó 9 ranganna). Braithfidh gach rud ar uimhreacha agus níl aon brú ar thuismitheoirí aon slí. Ní bheidh rang na Naí Shóisearacha á dhéanamh pé scéal é mar sin ní ghá daoibh a rá an mbeadh suim nó nach mbeadh suim. Tá seans ann áfach, má cuirimíd deireadh leis i mbliana go gcailfimíd ár sraith sa linn snáimhe sna blianta ata ag teacht. I leith an easpa spáis sa charr clós táimid ag lorg drop off zone le fada anois ón Roinn. Tá ár gcás acu agus deir siad go bhfuilid ag féachaint isteach ann. Mar sin beidh orainn a bheith ciallmhar leis an spás atá againn! Ná bí ag crocadh timpeall lasmuigh roimh nó tar éis scoile. Tuigimid nach bhfuil sé seo oiriúnach ach le cúnamh Dé tiocfaidh feabhas ar seo go luath. Beidh mé, gan amhras, i dteangbháil arís go luath! Welcome back to you all. We have put down our first day now and we got on fine with it. I would like to share and receive some information from you. Firstly, I would like to focus on the school uniform. All the children should have suitable dark school shoes, not for example, boots, Lelli Kelly shoes, UGGS or multi-coloured / neon runners. I understand that the children want fashionable shoes, but it would be better to wear them outside of school time. I am certain that the children will be very happy about this and it will be easier to put them in their full school uniform! Children should not wear any jewellery with the exception of very small earrings- (small studs) if they wish to do so themselves but obviously there is no need. This is for health and safety reasons. Every child should have a neat, appropriate hair style and the girls should have their hair tied back if possible to (try) to prevent the spread of head lice. This will all be explained to the children at school. Quite a number of children last year chose not to do the swimming classes for various reasons. I would like to find out the number of children that would take part this year to make the decision to make it available or not. It is extra work for the teachers, administration work for me and Hilda and extra cost for you as parents, but I do believe it is worthwhile for the children. The smaller the group, the greater the cost so the decision will be made when I see the result. There will be a list of the children in the class on the door of their class room. Put a tick under the 'yes' or 'no' on the list or call Hilda to let her know before next Friday (7th Sept 2012). The cost will be around €11 per lesson for the classes if they go ahead. Everything will depend on numbers and there is no pressure on parents either way. The Junior Infants will not be swimming so there will be no list on their door. There is a chance, however, that if we put an end to the swimming this year, we will lose our slot in the swimming pool in the coming years. With regard to the lack of space in the car park, we have applied for finances to construct a drop off zone from the Department again this year. They have told me our case is under consideration at the moment. It is out of my hands for now therefore we will have to be sensible with the space we have! Try not to delay at the busy times before AND after school. We aknowledge that the car park situation is not ideal but with God's help it will improve soon. I will, without doubt, be in touch soon! I hope this update finds you all well. We have been keeping busy here at Sáile since we last spoke at Christmas and would like to take the chance to update you on the activities available over the coming autumn months. We have recently acquired a new prefab space (~10x8m)and are busy preparing it for birthday parties, fitness classes, workshops and meetings. The C~Room will be available to hire from September. Social Games are a great way to keep fit, have fun, learn new skills and make friends all year round. The games are open to everyone. A pay and play policy operates with teams selected on the night. Try it out! New people always welcome. Special Offers: Make the most of the remaining summer holidays! August Back 2 School Special; 5-aside pitch, tennis court, basketball court, only €10 per hour! Hooked on Hockey? 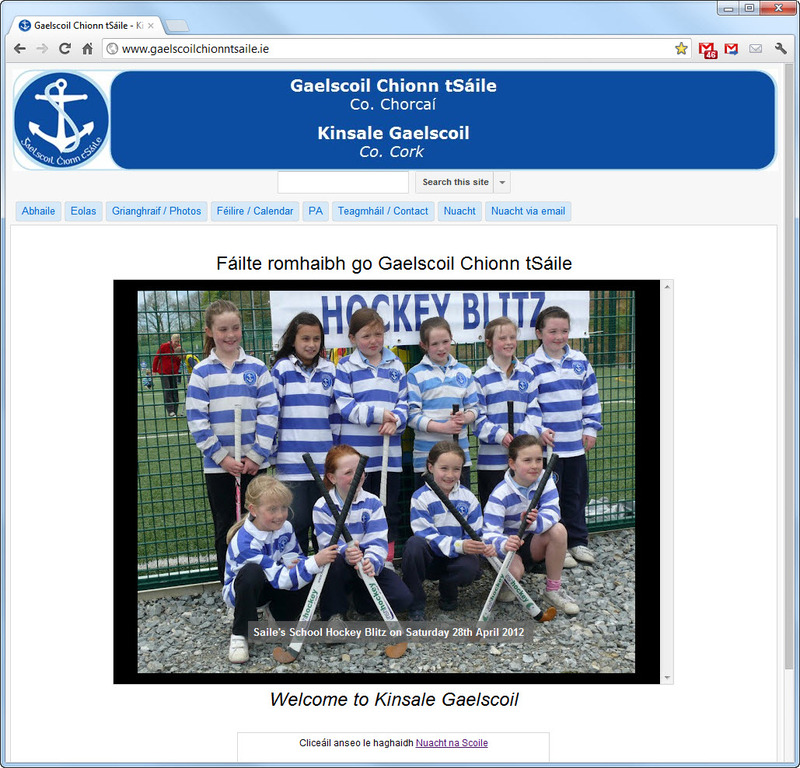 Thank you all for your support in introducing under-age hockey into Kinsale. The numbers of children attending the 4 coaching sessions in May far exceeded our expectations and was a resounding success. 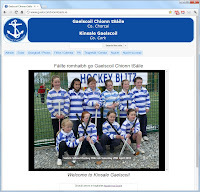 Kinsale Hockey Club will hold their first AGM on Monday 27th August, Trident Hotel at 7pm. Everyone welcome If you are unable to attend but would be interested in the outcome of the meeting, please email kinsalehockeyclub@gmail.com with your name and contact information. Our fundraising efforts are now focused on the indoor Sports and Community Centre, which will feature an indoor sports/community hall, a boxing/martial arts dance studio, meeting rooms, gymnasium, childcare facilities. We estimate this centre to cost €1.5m. Once built this facility will benefit all of the community and we are asking local clubs, groups, schools, businesses and individuals to help fundraise toward your centre, to get involved and play your part once again. See attachment. Check out our website www.sailesportsandleisure.ie for more fundraising photos and to hear all the news on the Sports development especially the hockey club. We are delighted to have been awarded €20,000K from the Cork County Council Community Fund 2012 toward building a new Sports and Community Centre. It's a great endorsement for the project and a much needed boost to our fundraising efforts. We have submitted a strong application for funding to the Sports Capital Programme 2012 which was released earlier this year. Thanks to all groups, clubs and committees that wrote letters of support which were sent with the application. Local TD's and councillors will also be making strong representation for our case to the Department of Transport, Tourism and Sport. Your continued support is very much appreciated going forward. Tá sé deacair le creidiúnt go bhfuil na laethanta saoire thart agus go mbeidh an scoil ag ath-oscailt ar an Déardaoin! Déardaoin 30 Lúnasa 2012 – deireadh na mbliana: 08.50 – 13.30 gach lá. Déardaoin 30 Lúnasa 2012 – deireadh na mbliana: 08:50 – 14:30 gach lá. Beidh cead ag Rang 2 ar aghaidh siúl abhaile leo féin nó fanacht lena dtuistí lasmuigh den geata. Toisc go mbeidh árdú mór arís ar an méid páistí a bheidh ag dul abhaile ag a 2.30 beimid ag moladh dos na páistí siúl abhaile i ngrúpaí más féidir leo nó fiú siúl go poinnte sábháilte le bualadh libh ann. Seo dos na páistí níos sinne, ach go háirithe. Táimid ag cur fáilte roimh 36 páistí nua i mbliana. 33 Naí Bheaga, 2 i rang na Naí Shíns agus buachaill amháin i Rang 2. Toisc go raibh an Roinn Oideachais chomh mall chun an t-airgead a thabhairt, tá an obair tógáile fós ar siúl agus beidh sé ar siúl ar feadh cúpla seachtaine eile. Beidh na seomraí ranga ullamh don Déardaoin ach ní bheidh snas ceart ar an áit go ceann tamaill eile. Ár leiscéal faoi seo ach níorbh fhéidir linn aon rud a dhéanamh faoi in aineoin gur thosaíomar an proiséas Mí Dheireadh Fómhair seo chaite! Ag súil go mór le bliain nua a thosnú libh ar an Déardaoin. It's hard to believe that the holidays are over and that the school will be re-opening on Thursday! Thursday 30th August to end of year: 08:50 – 14:30 every day. Classes 2 to 4 have permission to walk home themselves or wait for their parents outside the gate. As there will be a big increase in the number of children going home at 2.30 we will be encouraging the children to walk home in groups if they can or to walk to a safe point to meet you. This is for the older children, especially. We are welcoming 36 new children this year, 36 Junior Infants, 2 in Senior Infants and one boy in 2nd class. Because the Dept. of Education were so slow in sanctioning the money, the building works are still in progress and they will be still for another couple of weeks. The class rooms will be ready for Thursday but there won't be a proper finish on the place for another while. Our apologies about this but we couldn't do anything about it despite the fact that we started the process last October! Really looking forward to starting a new year with you on Thursday. Bus Eireann have now issued tickets to all children who have qualified for the school bus. The School Bus will commence on Thursday 30th August 2012 and pick up area will be the same as last year. Please ensure children have their tickets with them at all times while traveling on the bus. We are going to run the afterschool club again next September, this is to facilitate a one pick-up time per family. It is only for children in the Junior classes who have siblings finishing at 2.30. The service is also being offered to the children who use the School bus (as this only collects at 2.30pm). The Club is managed by the Parents Association and is run by the teachers.